Thought you would like a look ahead to the upcoming week as many parents get ready to send their kids back to school tomorrow (including my family)! You may have noticed this weekend that it felt more like, well... regular summer! Or even a bit better. You can thank a weak cold front that moved through today for the extra cloud cover that helped keep temperatures in check, despite not much rain. Also, dewpoints were a bit lower (lower 70s vs. mid to upper 70s) which makes a lot of difference as well. Instead of heat indices in the 110-115 range, we managed to stay below 105 yesterday and 100 today. NWS forecast surface map valid overnight tonight showing a stationary front located to our SOUTH (a bit unusual for mid-summer, but a welcome sight!). The frontal passage has resulted in more cloud cover and now slightly lower dewpoints. The cold front will remain to our south for the next couple of days and dewpoints should recede a few more degrees, meaning a couple of comfortably warm days ahead with highs in the lower 90s and lows in the lower to mid 70s. Rain chances should also be about nil as the more moisture-rich air remains to our south. A pretty good way to start off the new school year! 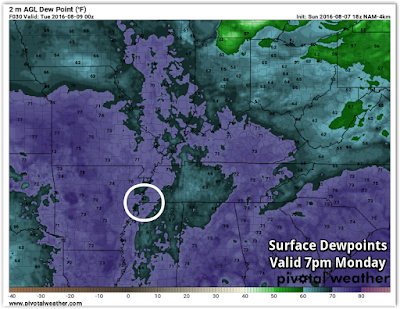 Forecast dewpoints for Monday evening from the high-resolution NAM model showing dewpoints near or below 70 in the metro, which is much more comfortable (less "sticky") than the mid to upper 70s we experienced to end last week. While it definitely feels more tolerable, a couple of very long streaks are still intact for the Memphis area. First, as of today, it has been 58 days (since June 10) since the airport has recorded a temperature in the 60s. That's good for #4 longest such streak on record here and it appears we may reach the #2 spot as there are no lows below 70° forecast for the coming week. In addition, high temperatures have reached at least 88° for 64 straight days as of today, which is the 3rd longest streak on record. That run of hot weather also won't end this week. (Tables below show data through August 6). Looking past the early week timeframe, thunderstorm chances increase a bit as we head into the latter half of the week and next weekend thanks to a non-tropical low pressure system that will affect the northeast Gulf coast early this week then slowly drift into Alabama later in the week. While we won't get torrential rain from it, areas along the Gulf coast from Louisiana to Florida will likely deal with flooding rains this week due to the nearly stationary low co-located with a massive warm water source. More than a foot of rain could fall from New Orleans to Tampa with some spots seeing 15-20"! NWS forecast rainfall through Friday evening. Flooding rain is likely along the Gulf coast from a non-tropical low pressure system that will likely not form into a tropical depression or storm. Locally, we'll just see increased chances of showers and thunderstorms mainly during the hottest part of the day Wednesday into the weekend. Early signs point to that low merging with another cold front next weekend, which could enhance our rain chances a bit by then and also PERHAPS end our streak of 88°+ high temperatures. That's a bit far out to know for sure. We'll keep you posted! 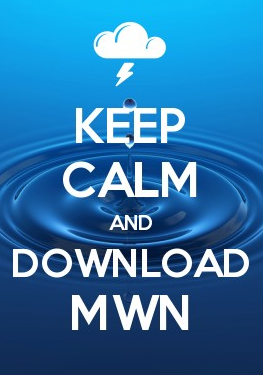 Keep an eye on the MWN Forecast via our mobile apps or website for the latest. Good luck to all of you parents - and the kiddos - this week if they are returning to school!